The Host Communities of Nigeria ( Producing Oil and Gas) HOSTCOM, Itsekiri Chapter, says Delta State Governor, Dr. Ifeanyi Okowa, should as a matter of necessity, set up machineries in place for the reconciliation of all aggrieved persons and factional groups in the state, including HOSTCOM, to enable Peoples Democratic Party maintain its dominance in Delta State ahead of the 2023 elections. HOSTCOM Itsekiri Chapter gave the advice in a press statement to congratulate Delta State Governor, Dr. Ifeanyi Okowa on his re-election in the recently held polls. While also congratulating the legislator -elect of Warri Federal Constituency, Chief Thomas Ereyitomi, HOSTCOM Itsekiri Chapter equally rejoiced with Dr. Augustine Uroye, Hon. Fred Martins and Hon. Emomotimi Dennis Guwor for their victories as legislators -elect for Warri State Constituency Seats. The press statement signed by Engr. Tuoyo Woligho, Pa. Otimeyin Tonukarin and Benson Erewa Meggison, chairman, secretary and leader of HOSTCOM Itsekiri Chapter, appreciated" Hon. Michael Diden, Hon. Daniel Mayuku, Dr. Joseph Otumara, Hon. Godwin Ebosa, Hon. Mofe Pirah, Hon. Benjamin Iwetan and other PDP faithful" for their dogged efforts to" maintain Delta State, a PDP State". 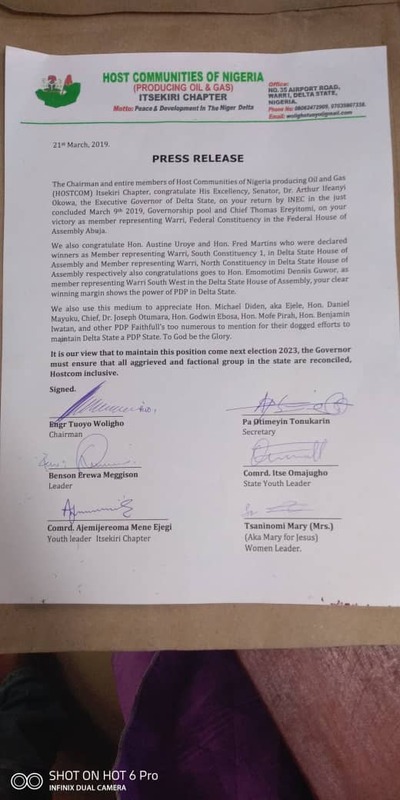 Fresh Angle International can report that others who signed the press statement are state youth leader, Comrade Itse Omajugho, youth leader of Itsekiri chapter of HOSTCOM, Comrade Ajemijeroma Mene and Tsaninomi Mary, women leader.